Yes, I am a material girl. The Strategic Fabric Reserve has grown beyond the allotted cupboards into plastic containers hidden under living room furniture and my desk. Reader, it’s true: I have a fabric problem. I’m currently working with a remnant of wool camblet from a friend’s stash, left over from making someone else’s coat. There’s just enough to make me a Spencer (with a little perfectly-accurate cuff piecing), and I’m finding that running the needle through the wool is like a knife through butter. Baby, it’s smooth. It’s taken me a while to learn this, and I’ll confess: I still have IKEA furniture, because I still have a teenager living at home, and three insufferable cats. But we swap out as we find affordable better things, because they are more beautiful and more pleasing. 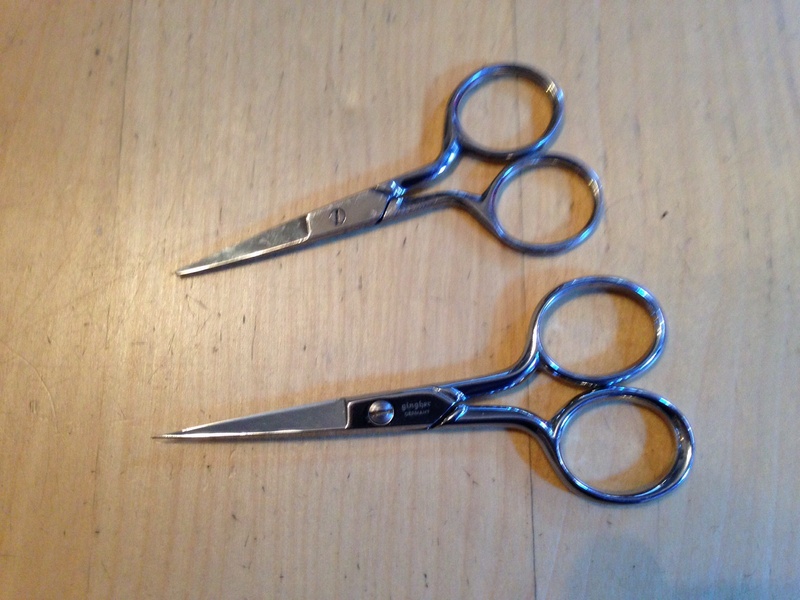 Shears: former fabric and current fabric. You can do the same with your sewing (or cooking or carpentry or cat husbandry) tools. 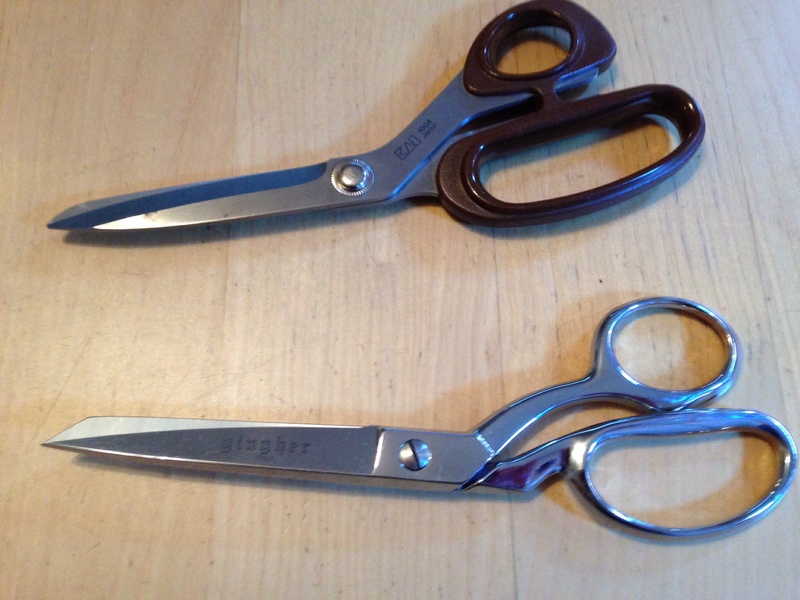 My former fabric shears finally gave up after 15 years; I replaced them with better Ginghers (thank goodness for coupons) and downgraded the formerly “best” scissors to pattern-cutting duty. 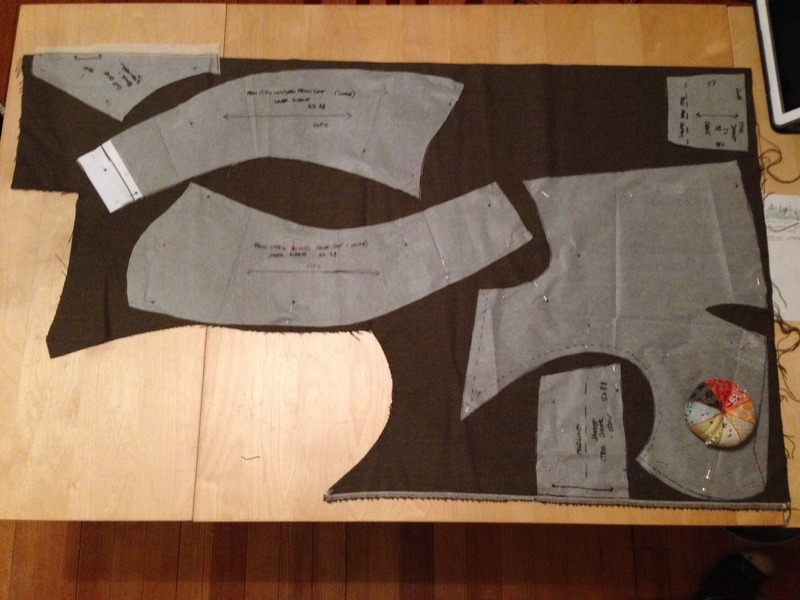 I have small thread scissors for home, and scissors for events that I’ll shed fewer tears over if I lose, because event sewing is often mending and not garment construction. Second best for events; best for home. Buy it once: that’s an ideal that can be hard to achieve in reenacting. Research moves on, everybody makes mistakes**, but you can never go wrong buying the best you can afford. Ease of use and finished beauty will make it worthwhile. *They laughed when I bought that striped velvet from Wm Booth at Bennington– until they saw the originals I had in mind.Quirky can be right and even amazing, but cheap requires caution. **I hear this in my head as the refrain from a New Order song at least once a day. And then I sigh. But it’s true, and worth taking to heart without beating yourself up over it. You will survive whatever unfortunate yardage or pink-handled, blistered-inducing scissors you now regret. There’s always the office Yankee Swap or Goodwill. Oh I soooo hear you! I guess that’s why I still have 4 yards of Kelly green wool in my Strategic Reserve under the bed. I found it in my Grandmas stash, and it is the most gorgeous and lustrous piece imaginable–far too nice to have donated to the thrift with the rest of her clothing! (Some day when I get around to making it I will be known as that crazy old lady who always wears green!!). Congratulations for making that nice spencer pattern work for you. And I know just what you mean about quality fabrics. There will be nothing so satisfying as setting in those sleeves in buttery soft wool.